Korean telecommunications company SK Telecom claims to have built the world's first HD voice service to run on speedy LTE networks. Guess what Korean phone is getting it first? Samsung's Galaxy S3 is the flagship smartphone for Google's Ice Cream Sandwich Android OS, and as such it gets preferential treatment, particularly on its home turf, it seems. It doesn't hurt that the phone is LTE-ready out of the box, or that it's one of the most popular phones in the country. SK Telecom is making sure everyone's aware that what they've established is the first-ever HD voice service to eat up LTE data. Sprint reportedly announced plans to launch a similar service later this year, but it looks like SK Telecom has beat them to the punch. HD Voice over LTE will increase call quality and reduce connection times and latency "dramatically," according to SK Telecom. In addition, the operator promises that the service will "evolve and develop into diverse services in the future," though that's about as specific as they're willing to get at the moment. 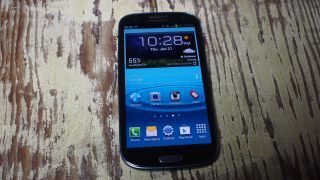 Samsung's Galaxy S3 is perfect for SK Telecom's new HD Voice network. The flagship Ice Cream Sandwich device is LTE-ready, and it's become a hot little number in its home country of South Korea. In fact, sources report that the Galaxy and the S3 caused something of a boom in the country, with more than half of mobile phone users now equipped with smartphones. SK Telecom plans to pre-load new Galaxy S3 devices for HD Voice compatibility, with an update rolling out later for existing Galaxy S3 users. The operator also pledged to keep the cost of LTE HD voice in line with its current 3G prices, and maintain its per-second billing standards. They haven't announced plans to bring the service to any other devices, but stay tuned for more news.